The Cornelius™ Teething Toothbrush, designed with realistic stimulating corn-cob texture and wide, easy-to-grasp “husks”, every surface of Cornelius provides soothing relief to sore teething gums of infants and toddlers from 3 to 12 months. Your baby will love this new Banana Baby Cornelius Teething Toothbrush! Great, unique baby shower gift! The Cornelius™ Teething Toothbrush, designed with realistic stimulating corn-cob texture and wide, easy-to-grasp “husks”, every surface of Cornelius provides soothing relief to sore teething gums of infants and toddlers from 3 to 12 months. 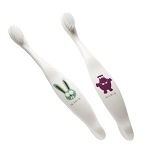 The Cornelius Teething Toothbrush is crafted from the highest quality food grade silicone. There are no hard parts, pieces, or glue. The brush can be easily tossed in the dishwasher for cleanup, or placed in the freezer to provide cool soothing relief. 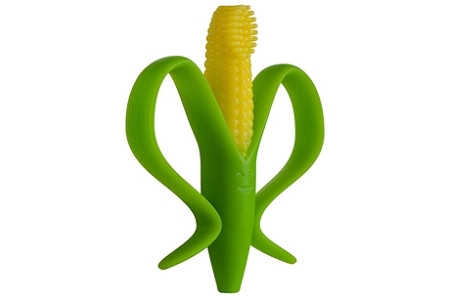 Cornelius is completely non-toxic, BPA free, phthalate free, lead free, 100% food grade silicone. We are proud to say that Cornelius is made in the USA, in Albany, New York. 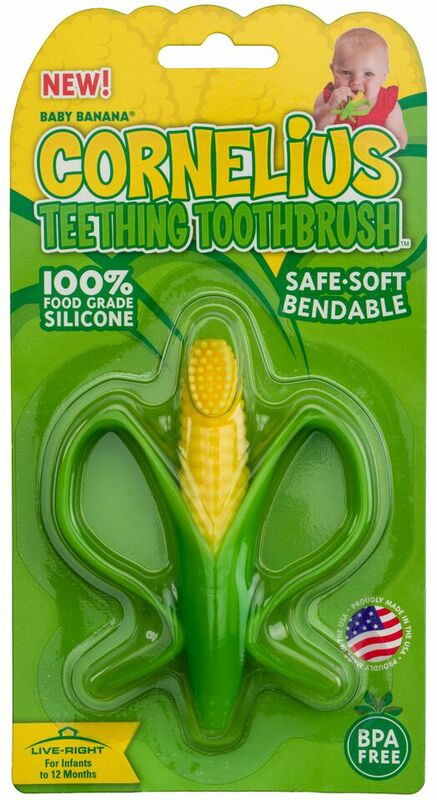 Cornelius is certain to give Live-Right a “CORN”-er on the teething market. Parents and babies alike will be excited to buy the “cream of the crop”. Please note the following: CPSIA tested for phthalates and lead – all safety requirements met, FDA registered 300-6124900. Also, this brush is safe for the dishwasher and freezer for sanitizing. Measurement: 4? x 8? x 1? We hope you love your Cornelius Teething Toothbrush! This thing seemed a little silly, but after seeing so many pictures of everyone's child with it, I decided to give it a try. My baby loves it, easy to hold and the right texture. I like the handles, makes it easy to tether. Sadly, hair really likes to stick to it. Still a favorite!